Pain radiating down the arm after shoulder surgery can and does occur. The cause of radiating arm pain can arise from the one of many sources: inappropriate or prolonged positioning, cervical injury or aggravation and hematoma. First and foremost the arm is often positioned such that it is hanging and as such may be exposed to a inappropriate or prolonged traction and tension placed on the shoulder joint. This can cause an injury to the shoulder joint and or the brachial plexus, a bundle of nerves that cross the first rib and provide sensation and motor function to the arm and hand. A second cause of pain radiating down the arm is a cervical disc injury or aggravation caused at time of surgery due to positioning. The patient is put to sleep while resting on their back but are repositioned after they are asleep to optimize the working conditions for the surgery. The neck, shoulder and arm are all moved. If particular attention is not directed to the patient during the positioning, a cervical disc may be injured or aggravated. The result is a pain radiating down the arm (cervical radiculopathy). Another cause of pain radiating down the arm is a expanding blood clot otherwise known as a hematoma. 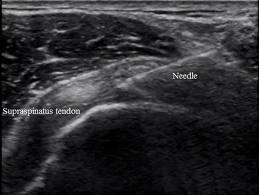 If left untreated the hematoma can compress critical blood vessels and nerves with resultant arm pain. The morale of the story is that surgery and anesthesia are not without significant risks. Fortunately patients with shoulder dysfunction now have the opportunity to use stem cell therapy to regenerate damaged ligaments, tendons and worn cartilage in the joint without surgery or anesthesia. Regenexx is a simple needle-in, needle-out procedure which allows patients to use their own stem cells to regenerate damaged joints, lumbar discs and non healing long bone fractures.